Holiday.gr - Abrami, a trip to a myth! Abrami (Abraam) is a very small but famous beach. 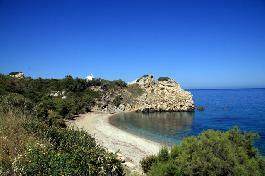 It has a splendid shore with clear waters on the way from Chora (town) to Apollona. The beach distinguishes for the warm waters that-as it is said- are due to the marine flows. On the left part of the bay stands the small church of Agios Nikolaos (Saint Nicholas). Been to Abrami ? Share your experiences!